Ziferblat Albert Dock - Pay for the time you stay | gingerbread smiles. When we arrived in Liverpool we decided to go for a stroll around Albert Dock which was over the road from our Travelodge. The way that Liverpool has kept the heritage of its old dockland is brilliant. There is gorgeous architecture all around the dock as they've re-purposed old warehouse buildings to use for today's shops and restaurants. There is a lovely chilled atmosphere around the dock welcoming a gentle stroll allowing you to take in everything. As we were walking we stumbled across Ziferblat. Intrigued by the concept, in which you pay 6p for each minute you are in rather than what you consume, we decided to go inside. The interior was very homely and old fashion with lots of different chairs, tables and sofas around the room with people of all ages taking a pew. We sat down and decided to make a beeline for the kitchen to see what delights they had in store. I found it amazing everything they had on offer. 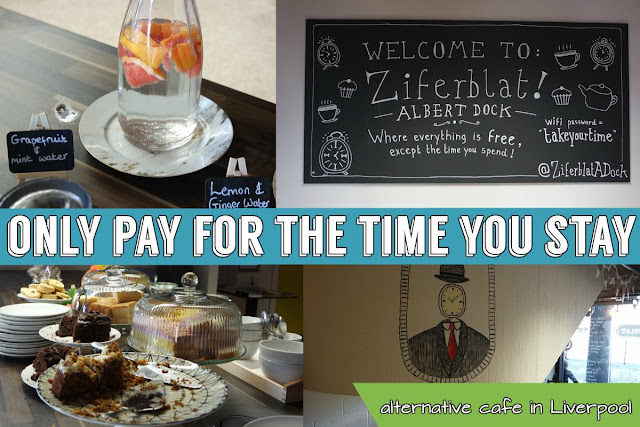 You could get a cup of tea and a piece of cake or indulge in cereal and a fancy coffee with flavoured syrup. There was numerous yoghurt flavours in the fridge, nibbles on the counter and many biscuits. You could help yourself to as much as you wanted and only pay for the time that you stayed. We had some flavoured water and a piece of cake each. It was good cake and the water was refreshing. After we ate we had to do our own washing up! That's kinda part of the concept too. It's like a home from home so you have to wash your plates and cups and put them away. After nearly 30 minutes we decided to get back on the road after checking out and paying our fee. I think this is a great concept which gives people a cosy place to get away, although the the rising charge may pray on your thoughts. There are currently three of these places in the UK; one in London, Manchester and Liverpool, with a numerous others throughout Europe. I would definitely come back for more cake and biscuits when I'm in the area.